Gustave Verbeek (born Gustave Verbeck (1867 – 1937) was an illustrator and cartoonist, best known for his newspaper cartoons in the early 1900s featuring an inventive use of word play and visual storytelling tricks 1). Verbeek was of Dutch ancestry, but was born in Nagasaki, Japan, the son of Reformed Church in America missionary Guido Verbeck. He grew up in Japan, but went to Paris to study art, and worked for several European newspapers, creating illustrations and cartoons. In 1900 he moved to the United States, where he did illustrations for magazines such as Harper's, and produced a series of weekly comic strips for newspapers. In the 1910s he abandoned cartooning and became a fine artist. He was noted for his expressionist monotypes, which were the subject of an article in The Century Magazine in June 1916. He died in 1937 in New York City, New York 2). Verbeek's first strip was Easy Papa, a fairly conventional strip about two mischievous kids and their father, similar to the highly popular contemporary strip The Katzenjammer Kids, which ran in a competing newspaper. Easy Papa appeared in The New York Herald from May 25, 1902 through February 1, 1903 3). 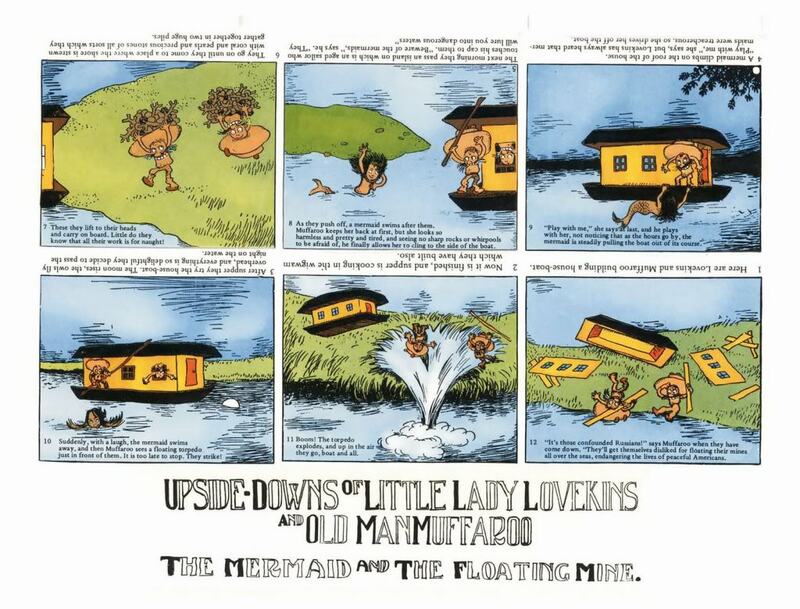 Verbeek is most noted for The Upside Downs of Little Lady Lovekins and Old Man Muffaroo, a weekly 6-panel comic strip in which the first half of the story was illustrated and captioned right-side-up, then the reader would turn the page up-side-down, and the inverted illustrations with additional captions describing the scenes told the second half of the story, for a total of 12 panels. His signature usually appeared at the top of the first/last panel, upside down. The two main characters were designed such that each would be perceived as the other character when inverted. For example, in one often-reproduced panel, Muffaroo appears in a canoe next to a tree-covered island, and is being attacked by a large fish. When inverted, the image shows a later scene of Lovekins in the beak of a giant roc: Muffaroo's canoe has become the bird's beak, the fish has turned into the bird's head, the island has become its body and the trees its legs, and Muffaroo has turned into Lovekins. Verbeek created a total of 64 of these strips for The New York Herald, from October 11, 1903 to January 15, 1905 4). Verbeek's longest-running strip was The Terrors of the Tiny Tads, published by the Herald from May 28, 1905 to October 28, 1914. This strip features a group of four unnamed and interchangeable boys, who encounter a variety of strange creatures based on inventive word combinations. For example, they find a “hippopautomobile” (a hippopotamus with a steering wheel and seating in its back as in an automobile), a “pelicanoe” (a pelican in which a rider could sit and paddle like a canoe), and a “samovarmint” (a samovar for serving tea with the head and claws of a wild animal). As with The Upside Downs, the strip's text consisted of captions below the illustrations; there were no speech balloons. 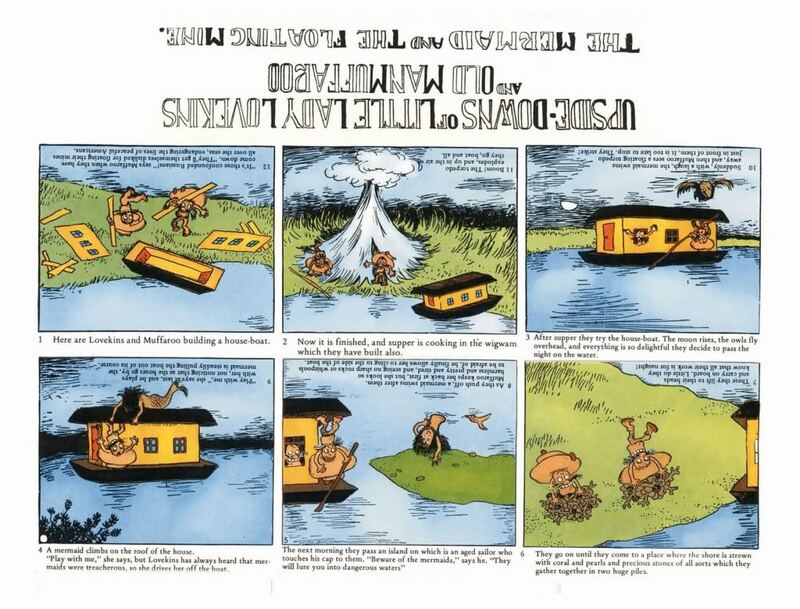 Dan Nadel describes the strip as “quiet, subdued, and somnambulant” in character, partly because Verbeek eschewed “speed lines, stars of pain”, and other such cartoon conventions 5). 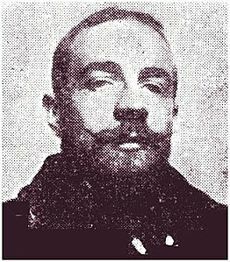 He created a short-lived strip in 1910 called The Loony Lyrics of Lulu. These strips are about a girl who encounters imaginary creatures and writes (inoffensive) limericks about them 6).